Silence is not an absence, but is charged with meaning and action. To speak of silence means to speak of a multitude of paradoxes, as well as to enter an exciting avenue for literature, activism and interdisciplinary scholarship. 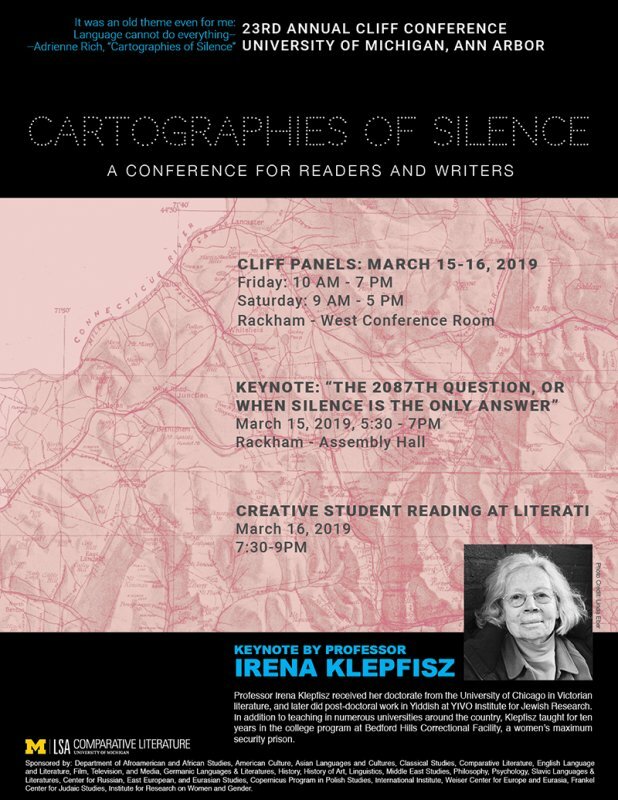 Our conference interrogates what it means to plumb silences in the archive in search of unheard voices, and invites scholars to investigate the meanings of silence as a critical category. 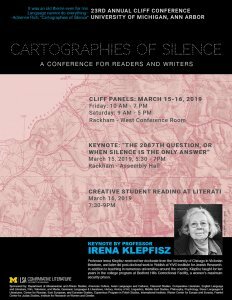 In particular, this conference is interested in mapping – across scholarly and creative disciplines – questions of translating silences in the archive, in the text, in the subject, and in activism. What are the possible ways of translating silence when events and experiences resist such translation? What challenges and possibilities does silence offer translators and scholars, who are tasked with making meaning of both the enunciated and the unsaid or untranslatable? How can we engage with knowledge that does not yield itself to current academic frameworks? In what ways can a focus on silence help to transform knowledge itself? Professor Irena Klepfisz received her doctorate from the University of Chicago in Victorian literature, and later did post-doctoral work in Yiddish at YIVO Institute for Jewish Research. In addition to teaching in numerous universities around the country, Klepfisz taught for ten years in the college program at Bedford Hills Correctional Facility, a women’s maximum security prison. Last year, she retired after 22 years of teaching Jewish Women's Studies at Barnard College. Klepfisz immigrated to the U.S. at age 8 and was raised among Yiddish-speaking, Jewish Labor Bundist (socialist) Holocaust survivors in the Bronx, where she attended public schools, a Yiddish shule, and mitlshul. She was an activist during the Second Wave, particularly in the lesbian/feminist movement, and addressed issues of anti-Semitism, Israeli/Palestinian peace, Jewish identity, and veltlekhe yidishkayt/secular Yiddish culture. Klepfisz’s extensive publishing and performance record includes founding and co-editing Conditions magazine, serving as the Yiddish editor of the Jewish feminist Bridges, contributing to Nice Jewish Girls: A Lesbian Anthology, and co-editing The Tribe of Dina: A Jewish Women’s Anthology. She authored two performance pieces commissioned by the Jewish Museum (NY): Bread and Candy: Songs of the Holocaust and Zeyre eygene verter: In their own words (Yiddish women writers). She is the author of A Few Words in the Mother Tongue (poems) and Dreams of an Insomniac (essays), and most recently co-edited The Stars Bear Witness: The Jewish Labor Bund 1897-2017 and Koved zeyer ondenk: Honor to Their Memory (for the 75th anniversary of the Warsaw Ghetto Uprising).